Getting proper daily nutrition can be challenging for many people. LifeCORE™ is designed to complement individual dietary needs by providing wholesome, foundational macronutrition. 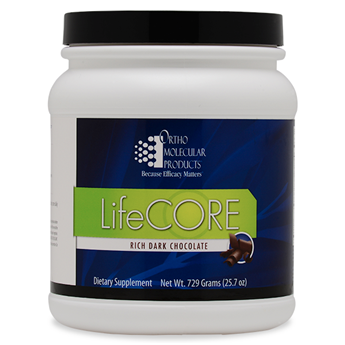 LifeCORE™ is a simple, added nutrition source that includes an ideal balance of organic brown rice and pea protein. These proteins have been shown to support satiety naturally by increasing cholecystokinin (CCK) and glucagon-like peptide-1 (GLP-1). CCK and GLP-1 are well-known satiety hormones that aid the body in decreasing food intake and increase signals of stomach fullness to the brain. These proteins promote post-meal satisfaction and helps maintain healthy blood sugar levels after eating. Carbohydrates are the body’s preferred fuel source, making this macronutrient essential to a well-balanced diet. However, the type, quantity and metabolic impact of carbohydrate intake is imperative to achieving balance and reaching wellness goals. LifeCORE provides the preferred ratio of low-impact carbohydrates, fiber, protein and healthy fats to fuel the body and maintain optimal health. LifeCORE™ is a balanced nutritional shake, free from common allergens, such as gluten, soy, and dairy, and does not contain fructose or any genetically-modified foods. It provides a diverse blend of pure plant proteins combined with other essential nutrients and fiber to support workout recovery or simply fulfill the needs of individuals seeking to get more protein in their diet. Just one serving of LifeCORE™ provides 20 g of high-quality protein. The unique complex of vegetable-based protein has a well-balanced amino acid profile, medium chain triglycerides and organic flax.